This is a rectangular flange Polarine Stanocola porcelain sign. This particular Polarine Stanocola sign is predominantly green and white with red and black text. 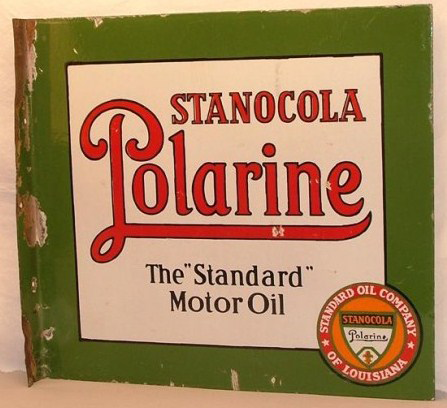 It reads, “Polarine Stanocola, The Standard Motor Oil, Standard Oil Company of Louisiana” and features a yellow and red emblem in the lower right corner of the sign.